Leading a group of men in combat is by far the hardest and most stressful job any person can ever perform. Commissioned officers have received some training for such an assignment, be it through ROTC, OCS, or from a military school or academy. However, the infantrymen who worked their way from a PFC to a Buck Sergeant in charge of a squad or, on a few occasions, the platoon, had little to no training on how to lead men in combat. Also, the tour of duty in Vietnam was for one year, or getting killed or wounded to the point they could no longer serve, whichever came first. As a result, almost all squad leaders had to learn how to lead men on a trial and error method, or they would try to emulate the methods used by other squad leaders who had served in the platoon. They had to gain the confidence of the men as they carried out the orders they received from the Lieutenant in charge of the platoon. The First Platoon of Company A, 1/8 Cav was one of the units that was involved in the combat assault into a village near Quảng Trị City [Thôn Xuân Dương], which is located about 20 miles south of the Demilitarized Zone, on March 25, 1968. Prior to the assault, the area was prepped with artillery fire. Immediately after the artillery shelling stopped, Huey choppers flew in and dropped off the platoon. After the platoon had been formed up, my squad was assigned as the lead squad. As a squad leader, I assigned John Giddings to walk point as he had done on several previous occasions. Giddings began moving forward and the squad began walking toward and into a grave yard. After we had entered the grave yard, the unit began receiving a heavy assault of gun fire. Giddings, and the rest of the squad, took cover behind the graves and the monuments. I took cover behind a grave monument about 10-15 yards behind Giddings, and called out to ask if he was okay. Giddings said that he had been hit in the arm, and I yelled out for a medic. Two medics were close by but, like the rest of us, neither could move because they were pinned down by heavy gun fire as well. I asked Giddings if he was able to work his way back to our position, but he couldn’t because he was pinned down by heavy gun fire. I began firing at the NVA positions in order to provide cover for Giddings so he could try to make his way back to cover with the rest of the squad. 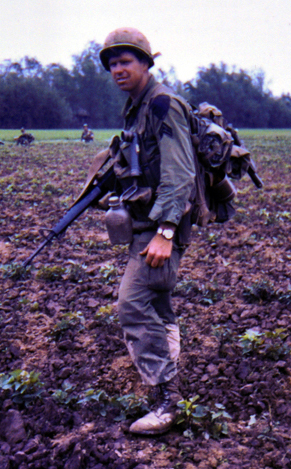 The NVA intensified the heavy gun fire assault of the squad, and rounds were hitting so close that I could no longer provide any covering fire. At this point, I was helpless, scared and angry. Giddings was wounded and had not been able to move and work his way to a point of safety where he could be treated for his wounds. I called out to Giddings again and asked if he could move at all, and he replied stating that he thought he could get back. Moments later, as Giddings was trying to make it back, he was hit with a burst of gun fire. He was hit by three rounds and died. The firefight continued for some time, and I survived with no physical wounds. 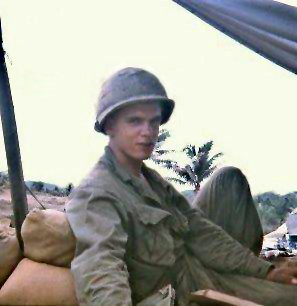 However, the mental anguish of assigning a buddy I had served with for ten months to walk point, and getting killed as a result, was very tough for me. Giddings and I were scheduled to leave Vietnam on the same day. I feel the pain to this day because I issued the order that resulted in John Giddings getting killed. The fact that I was following orders from the CO does not diminish this hurt, feelings of guilt and helplessness. For more on this action, see "The Lost Platoon — the Tragedy of March 25." Quảng Trị City — for a map, see: Camp Evans and LZ Sandra. Thôn Xuân Dương — for maps of this village, see: Thôn Xuân Dương and Quảng Trị, Thôn Xuân Dương (Detail).